Dupath Well. One of the best preserved well houses in the county survives near this village. To find it , leave Callington on the Tavistock road and take the first turning to the right, following the signs to the well. The building is constructed of granite and even the roof is fashioned from slabs of this stone. Inside, clear spring water fills a cruciform basin and then overflows into a granite basin shaped like a cylinder, (possibly an old font from a church). the well house, known also as St Ethelred's Chapel, dates from the early sixteenth century and had the reputation for curing whooping cough. The Flambard's Triple Theme Park at Culdrose Manor has attempted to recreate a Victorian village complete with a ''Chemist Shop Time Capsule'', another example of mahogany and glassware which still graced a real retail chemist in the Somerset village of South Petherton a couple of decades ago. 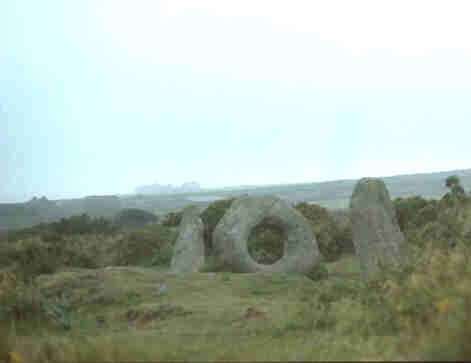 A large stone with a hole through it stands on the moor near Madron. Known as Men-an-Tol (The Holed Stone), it was once used to cure children of rickets by passing them naked through the hole nine times against the sun. This may have been seen as a mystical form of rebirth. Madron is also the site of one of the most famous holy wells in the county, though much of it has suffered at the hands of vandalism during the Victorian era. Like the Holed Stone, the well had a similar reputation for healing cripples and it was customary for mothers to take their children to the well on the first three Sunday mornings in May where they stripped them naked and plunged them into the water three times. The ritual then continued by passing the children nine times around well from East to West, the whole business being conducted in absolute silence. About fifty metres from the well lie the remains of an ancient building known as the Baptistry. In the South west corner of the building, a small cistern receives water from a stream which formerly enjoyed the reputation for curing skin diseases, ''wild fires'', colic, shingles, pains, aches and stiffness. Wild fires may have been the popular name for ergot poisoning, a common condition in former times when bread was made from rye which had turned mouldy. Colic was also common because of the frequent practice of sweetening rough cider by hanging a piece of lead in the brew. The resulting solution of lead acetate imparted an agreeable taste to the drink but those who imbibed such cider accumulated the toxic metal and developed the infamous Devonshire Colic, characterised by griping pains and gradually increasing paralysis of the limbs. On the edge of the village, there is a curious block of granite with a round depression in the centre of its upper surface. 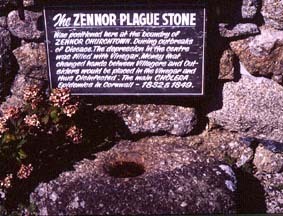 This is an example of a plague stone. During outbreaks of epidemic disease, the depression was filled with vinegar . All money which changed hands between the villagers and the outside world was thrown into the vinegar for disinfecting. It is thought to have last been used in this way during the cholera epidemics of 1832 and 1849.